Hello! My kitten's name is Sierra, I named her after the mighty redwoods in the Sierra Nevada Redwood Forest. But I want to go back to just last week. I work in a factory making paper products. At work, just as in any other job, there is a section dedicated to those who enjoy smoking (I'm not one of those) but word spread of a kitten hanging around the smoker's section outside, so I faced the smoke of all the cancer sticks and sat outside with the smokers. The machines are loud outside and it was dark, so I got up and started the "here kitty, kitty" and for a bit I heard nothing nor saw nothing, but as I continued calling through all the other loud sounds there was the faint cry of a kitten. I turned around to see a small figure sitting on the cement, I walked over and she ran away. I called her again and told her in a gentle voice that everything would be OK. She let me come closer, and she was so tiny - not small - tiny as in skinny. One of the guys gave her a bowl of water, others gave her scraps of food. She was so hungry I was scared she would choke from not chewing. My break was over. I hoped by the end of my shift she would still be out there, so after work I went straight to the smoker's section and called her again and she immediately showed up. By now there was light and I could see her creamy colored fur, orange tipped ears, tail and face. What a doll! I brought her home and she slept for a good two days - my work is surrounded by a lemon grove and eucalyptus trees, coyotes and hawks and raccoons and who knows what else is out there, such a terrible place for a little kitty she probably barely slept, trying to survive. 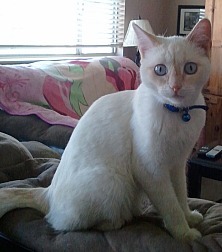 I took pics of her and showed my parents and niece who told me that she is a flame point or red point Siamese, so I looked up the name and sure enough she is a perfect match, right down to her amazing blue eyes. Because there are no homes around for a few miles, it’s all industrial with trees between the factory and the warehouses, I wonder if this little kitten was dumped by a truck driver or she jumped out of the cab when a door was opened. I will take her to see if she has a chip, but if she does it will be so hard to give her to her rightful owner, but I must do the right thing. If not she will have a home full of love. Today Sierra was taken in to have her kitten shots and de-worming shots, but before that she was checked to see if there was a chip. NO CHIP! YAY! I love her so much, and and can now welcome her permanently into my home, I can fully love her with all my heart. I was hesitant to get too attached only to find her owner and give her back. I will be taking her in for her second set of shots and get her tested for FIV and leukemia. She is beginning to gain weight and it is estimated that she is six months old. She will grow up to be happy, healthy and well loved. I have never owned a cat so patient, so loving and sweet. My son and her have a bond I have never seen - she loves him so much, as much as he loves her, it is an amazing bond. She is so smart and knows just what she wants. She stands at the fridge when she wants milk, looks up at me and gives me the sweetest meow, same when its dinner time. She waits for me at the door when I get home from work and sleeps in between my knees at night. She was the best gift I could have ever been given. What a lovely rescue story! 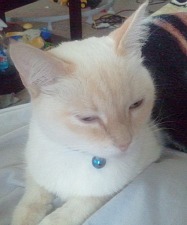 Sierra's a beautiful example of a flame/red point Siamese and so very cute! How extraordinary to find her out there in an industrial wilderness - you're probably right, I guess she may have escaped from a car or a truck. It's great news that she's not chipped and that you'll be able to keep her. I do of course feel sorry for whoever it was who lost her in the first place, but I'm so pleased you're going to be able to keep Sierra. She's such a cutie! I hope you have many years of love and fun with her. Siamese cats are such characters, you have all kinds of amusement and entertainment ahead of you. Are you going to have her chipped? It'd be a good idea even if you're planning to keep her indoors - it's always useful in case cats get out. Comments for Factory Friend Found! My Dad was on the porch out back in WV and heard (lord knows how with his hearing loss) a mew and traced it to one of the basement window wells. He retrieved the kitten, calling me and my brother who raced it to the vet. A perfect black Siamese covered in cigarette burns. A lady up the road bred Siamese, we guess a black turned up was tortured. We reported of course. The vet claimed Hyde would die but he fought through becoming a lovely interactive cat, a Hospice volunteer and the best cat we have ever had. So we really believe that God sometimes drops a kitten into lives that are improved by this gift. We think today he's sitting in Mom's wheelchair whirring at any touch or word, or chasing heavenly ping pong balls with Dad. I hope you don't find her owner. That beautiful little Sierra will be your best friend for life. It amazes me too how anyone can dump a kitten. My friend in Houston found a kitten barely five weeks old abandoned on Champions golf course. The place is crawling with raccoons and snakes and critters. It was raining and this little one would have died. Return to Siamese Cat Adoption Stories.